Malta, officially known as the Republic of Malta, is a southern European island country consisting of an archipelago in the Mediterranean sea. Lying just 80km south of Italy and around 300km north and east of the north African states of Tunisia and Libya, Malta has an important strategic location and fascinating history, having been continuously occupied since 5990 BC. The capital city is Valletta, the smallest and southernmost capital city in Europe. A city of stunning archiectural beauty, it is renowned for its baroque archicture, city walls and stunning palaces and museums which led to its Italian nickname Superbissima (Most Proud). The population of Malta is around 500,000, making it the tenth smallest country in the world and the fifth most densely populated. The majority of the population is ethnically Maltese, supplemented by expatriates, either active or retired from the United Kingdom and a smaller number from Italy, France, other Europeans and Lebanon. The official languages of Malta are Maltese (the national language) and English which is widely spoken and used in business communication. Maltese is the only semitic language in Europe. Malta is classifed as an Advanced Economy, one of 32 such countries recognised by the International Monetary Fund (IMF). Its major resources are limestone, a favourable location and productive workforce and its economy is dependent upon financial services, foreign trade (serving as a freight trans shipment point), tourism and manufacturing (mostly electronics and textiles). Film production is a growing industry. The Malta Financial Services Authority has been successful in attracting gaming businesses, aircraft and ship registration, fund administration and credit card issuing banking licenses. 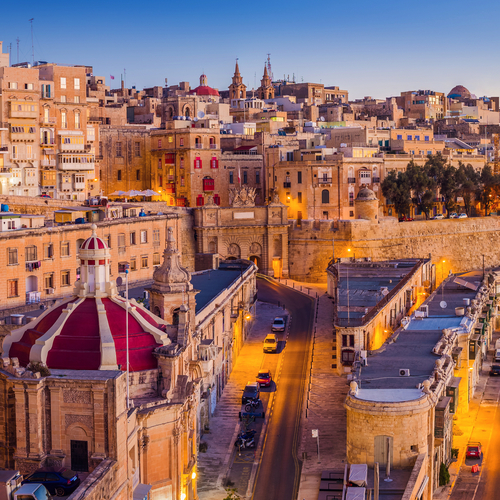 Malta is emerging as a sound jurisdiction for banking, finance and insurance services. Malta, known throughout history as a medical centre of the Mediterranean ("the nurse of the Mediterreanean") has a long tradition of providing publically funded healthcare. The first public hospital was opened in 1372 by the Knights of St John and quickly gained a reputation across Europe for its excellent care. During the First World War, the island served as a base for the evacuation, treatment and rehabilitation of allied soldiers and at its peak over 25,000 soldiers received treatment in its 27 hospitals. In 2011, a similar service was provided for evacuees from Libya. State funded healthcare is available to all citizens of Malta and long term residents via the network of public hospitals. Approximately 6.5% of GDP is spent on healthcare. There is a strong network of General Practitioners (GPs) providing primary care with the hospitals, providing the secondary and tertiary care services. Private sector care has long co-existed with the state sector and the government has recently decided to expand this sector to participate in its drive to transform the healthcare sector into a mediterranan hub of medical education, high quality medical care and medical tourism. Key areas for development are oncology, trauma care, aged care and rehabilitation. The Govenment of Malta has entered into strategic partnerships with international universities, medical schools and private sector healthcare companies to enable it to achieve its objectives in the development of this sector. St Batholomews and the London School of Medicine and Dentistry and the Royal College of Surgeons of Ireland are active participants involved in medical education with local institutions.